I'm Here. I'm Queer. What the Hell do I read? : Raquel D'Apice's Open Letter To The Female Hat-Wearing Dog in "Go, Dog. Go!" 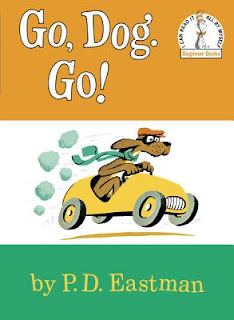 Raquel D'Apice's Open Letter To The Female Hat-Wearing Dog in "Go, Dog. Go!" 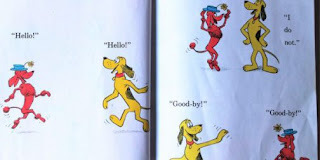 "Momentarily distracted by the humdrum parade of big dogs, little dogs, black and white dogs, I watched as you walked in, brimming with joy and confidence, and looked on as some total nobody, indistinguishable from most of the other dogs in this book, crushed you with his subtle rejection." "And you don’t even know me, but I wanted to take a minute to tell you that what matters is that you like your own hat, hat-wearing female dog. Who is this guy anyway, some sort of dog hat expert?? Who cares what he thinks??? Wear a hat you love and if he doesn’t like it? F*#% him." Who knew there was this dangerous self-esteem denying relationship message beaming directly into our childhood brains? It's brilliant, funny, and quite insightful. Read the whole essay here. My thanks to Danielle for sharing it!